If at all possible, arrange to visit the breeder's kennel. You will better know the relationship the breeder has with their dogs if you visit. You will get to see firsthand how the dogs are kept and cared for. You want dogs who are well kept in clean conditions and looked after by loving keepers. If you can visit the litter, ask also to meet the dam and the stud dog if he is on the premises. Meet as many dogs in the puppy's pedigree as you can while visiting. Reputable breeders will be proud of their dogs and happy you want to meet the other dogs. 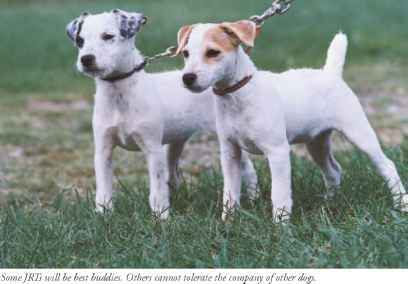 Any Jack Russell Terrier puppy should be allowed to stay with their dam and littermates for a full eight weeks. Some breeders keep pups a little longer. The pups are learning valuable lessons that they cannot get anywhere else in their lives. If denied, this time and learning can never be regained. The dam is teaching the pups, and they are teaching one another. 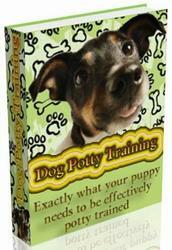 These beginning lessons give the dog an important foundation for life. A reputable breeder wants their puppies to have a good start, and to be a good pet and companion to you. A happy healthy pet comes from a good beginning. has been introduced to gentle children is more apt to love children and more inclined to be more patient with them. • The breeder's house and surrounding area should be well kept up and clean. • There should be no doggy smell when you enter the house. • Ask if it is possible to meet all the dogs. The dogs should be friendly enough to happily receive visitors. • Do the dogs have the run of the house? If not, can you actually visit the rooms they live in? This will tell you a lot about the environment in which they are raised. • Are all the dogs happy and sociable? • Are the dogs well groomed? • Have the sire and the dam of the litter had health checks for genetic disease? • Does the breeder BAER and CERF test his breeding stock? The BAER test scientifically proves the dog can hear, and the CERF test is to make sure the dog's eyes are in good health and clear. The BAER test need only be one time in the dog's life. The CERF test should be done yearly on dogs used for breeding. 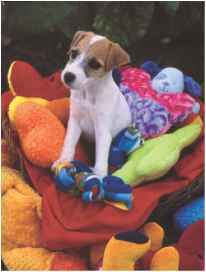 • Does the breeder have a purchase contract? • What kind of health guarantee comes with a puppy? 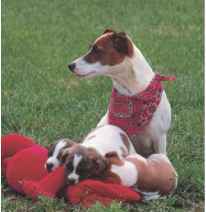 • Are the breeder's adult dogs registered with the Jack Russell Terrier Club of America? Good breeders want every dog they breed to end up in a permanent, loving home.